Are you struggling to get your child to relax or fall asleep? If so, then maybe it’s time you invest in a heavy blanket. Our sensory weighted blankets are designed with your family in mind. Whether you are buying one for trouble sleeping or sensory processing disorder, you’ll be happy you finally made the investment in a Harkla weighted blanket. Our minky dot design makes this a perfect sensory blanket, as the soft minky fabric, combined with the dots and added weight make a sensory input trifecta! Our goal at Harkla is to help your child live a happier, healthier life, and we both know getting them to relax and get a good nights sleep is one of the highest priorities for that goal. Children get messy, which means you need a blanket that easy to wash! 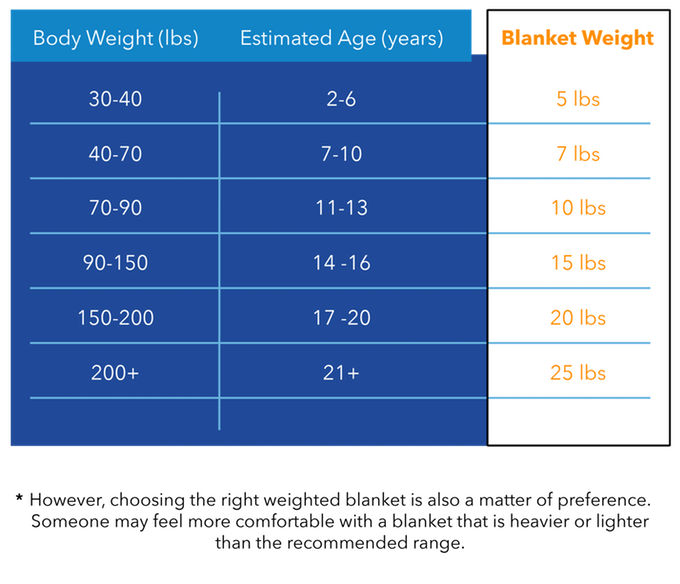 The rule of thumb for a weighted blanket is to be 10% of your body weight, plus a pound or two. So for a 60-pound child, our 7-pound blanket would work best. Click here to see our heavier blanket options. Click here to see our heavier blanket options. What Are the Dimensions of the Blankets? What is the Science Behind Weighted Blankets? The science behind weighted blankets is called Deep Touch Pressure (DTP). DTP is simply distributed weight across the body. If you'd like to read more about the natural benefits of DTP, we wrote a guide to it here. DTP releases serotonin in the body which turns into melatonin, as well as decreased nervous system activity. These combine to give a feeling of calm, relaxation, and naturally improved sleep. If you'd like to dive into the studies about weighted blankets and the science behind them, we wrote an article on it here. Who Do Weighted Blankets Work for? Weighted blankets have historically been used for those with special needs. However, they are beneficial to most people. Especially people who suffer from sleeping issues. Do Weighted Blankets Work for Adults? Yes, weighted blankets also work for adults. Click here to see our adult styles. I bought this weighted blanket for my almost two year old who has maybe twice slept through the night. Since purchasing it over two weeks ago his sleep has greatly improved. I am also very pleased with the blanket because my sister and mom have one but the weights make noise like bean bags as they shift. This blanket is silent! It is. Ice and puffy and soft. We are very happy. We bought the weighted blanket for our 3 year old daughter. I love the material and that is easily taken apart for washing. The weight is evenly distributed and the inner blanket stays well in place with the ties. A great product. Airy yet perfectly weighed. Bright colors and soft texture. Product cover will be easily washed. My granddaughter seems to be sleeping longer. Time will tell. I love my purchase. I use this blanket every night and sleep right through versus waking up every hour as I previously did.